Mike Daniels with one of his biggest days as a pro. The game was dominated by defense early, but the Green Bay Packers eventually wore Seattle down and knocked off the Seahawks 17-9 in the season opener at Lambeau Field. The Packers had a nearly 2-to-1 advantage in time of possession (39:13 to 20:47) as they closed out the victory in the final quarter. Quarterback Aaron Rodgers started show and tossed an interception in the first half, ending a streak of 251 straight passes without one, which was a career high. Rodgers would finish by completing 28 of 42 for 311 yards, one touchdown and one interception. His only scoring strike came when the Seahawks were late getting a 12th player off the field and as usual, the Packers took advantage. Rodgers looked to the sideline, saw the flag come out and then found Jordy Nelson down the middle for a 32 yard scoring strike. Earlier in the game, Nelson became the fourth receiver in Packers franchise history to reach 500 career receptions. He joined the elite company of Donald Driver, Sterling Sharpe and James Lofton. Nelson finished with seven receptions for 79 yards. Randall Cobb has the best day through the air, catching a team leading nine passes for 85 yards, including a long of 29 yards. Running back Ty Montgomery helped the Packers build their time of possession advantage, running the ball a career high 19 times for 54 yards and a touchdown. He also added four receptions for 39 yards. Montgomery’s six-yard touchdown run came with the Packers trailing 3-0. Mike Daniels strip sack was recovered by Kyler Fackrell at the Seattle six yard line. Montgomery found the end zone on the very next play. This day belonged to the defense though. The Packers held quarterback Russell Wilson to 158 yards passing and no touchdowns. The rush defense was swarming. 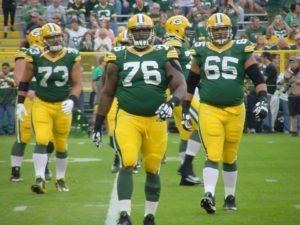 The Packers held former teammate Eddie Lacy to three yards on five rushes. Daniels and linebacker Nick Perry both collected a sack and a half. Perry made life miserable for Seahawks tackle Rees Odhiambo from start to finish. Odhiambo was making his first start at left tackle after George Fant tore his ACL during the exhibition season. As the Packers pass rush was strong all afternoon, the secondary was rock solid in their coverage of the Seattle receivers. Reserve tackle Kyle Murphy, filling in for Bryan Bulaga, who was a scratch before the game, gave up two sacks in the first half against one of the best defensive lines in the NFL. The Packers offensive line as a whole struggled with that front, allowing four sacks in all. On the injury front, the Packers lost OLB Ahmad Brooks with a concussion and offensive lineman Jason Spriggs with a hamstring injury. The Packers will take their 1-0 record to Atlanta next Sunday night to face the Falcons. Atlanta opened the season with a 23-17 victory over the Bears in Chicago.